Pesticides should never be poured down the drain because they contain toxic chemicals that can contaminate waterways. Instead, dispose of them as Household Hazardous Waste. Absolutely do not water the grass after applying garden chemicals. This runoff ends up in water drains that can contaminate lakes and rivers. It also makes your pesticides less effective against pests. Avoid using chemicals before a storm; if you do, they will be washed down storm drains, or leach into the soil, once it starts raining. Containers that held concentrate need to be rinsed out three times before they are thrown in the trash: to do this, add remaining spray to the tank. Next, add water into the container, swirl and then transfer to the spray tank. Finally, repeat these steps twice. Empty containers that held ready-to-use chemicals can be thrown in the trash without rinsing them out. 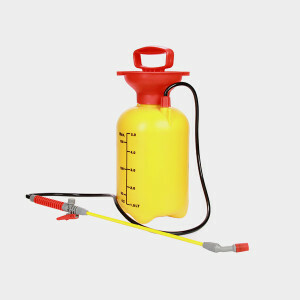 The best way to dispose of pesticides is to use them up completely, which reduces how much can leach into the environment. If you’re not going to use them up completely, try giving them to a friend. Consider purchasing ready-to-use products. Purchasing concentrations to dilute on your own can expose the body to harmful chemicals. Also the use of under-diluted chemicals is more damaging to the air, water and soil. Identify your pest problem and use the least toxic option to eliminate those pests (if you must use garden chemicals). Consider using bait stations or insecticidal soaps and oils. Find out more.